This application note come from National Semiconductor and contains more than 73 circuit diagrams. You can download it from the bottom of this post. 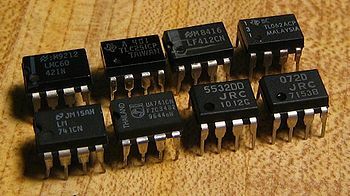 An operational amplifier, which is often called an op-amp, is a DC-coupled high-gain electronic voltage amplifier with a differential input and, usually, a single-ended output. An op-amp produces an output voltage that is typically millions of times larger than the voltage difference between its input terminals. Typically the op-amp's very large gain is controlled by negative feedback, which largely determines the magnitude of its output ("closed-loop") voltage gain in amplifier applications, or the transfer function required (in analog computers). Without negative feedback, and perhaps with positive feedback for regeneration, an op-amp essentially acts as a comparator. High input impedance at the input terminals (ideally infinite) and low output impedance at the output terminal(s) (ideally zero) are important typical characteristics.